Eric Parfit retired from his successful career as a motion picture producer and editor in 1970 and returned to his first love, painting watercolor landscapes. His works are in private collections in the US, Europe, and Saudi Arabia, among other places, and have been on public display around the world. He was elected president of the Santa Barbara art Association, and his work has received numerous awards worldwide. 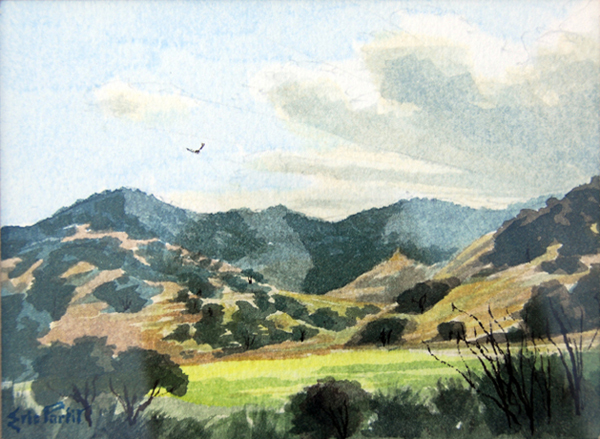 This signed watercolor depicts a scene entitled ‘Hidden Hollow’. Typical of Parfait’s work and very much like a traditional British landscape, but of course, the subject matter is uniquely American.